Ground-penetrating radar is a method used to help locate, identify, and label underground utilities. These can be wastewater pipes, traffic lights, electric grids, natural gas, fiber optics, and telephone lines. Companies use various detection and location methods for a vast number of underground lines. Of all the detection methods employed, ground-penetrating radar is considered the safest way to detect underground lines. GPR is a detection method that uses radar pulses to detect and create an image of the subsurface. The technology used capable of generating 3D images of underground power, pipe, sewage, and water lines. Although this technology is widely accepted and used in no-dig applications in the United States, GPR is slowly gaining momentum in Europe. Among other reasons, GPR surveys make detection of underground lines much easier with no risks involved. In addition to this, it saves you both the time and resources you would have spent unearthing everything only to find surprises underneath. GPR uses electromagnetic pulses to detect, identify, and even map utilities and other items in the subsurface. Based on magnetic principles, the pulses/radar can penetrate steel and concrete to help engineers know what lies beneath the surface, hence no need to dig or destroy anything. The non-intrusive nature of ground-penetrating radar is what makes it appealing to many today. It also helps limit the destruction of lines and other structures. Cable and pipe locators are still the most commonly used methods for detecting underground utilities. These use electromagnetic induction to detect items in the subsurface. Although the techniques do work, they are incapable of detecting plastic, concrete, ceramics, fiber optic, and other non-metallic objects. GPR, on the other hand, discovers all. It can catch anything from metallic drums to plastic pipes. It gets even better, ground-penetrating radar can detect pipe leakage and voids and at the exact location where the leakage is. This is made possible by the post-processing of acquired data. 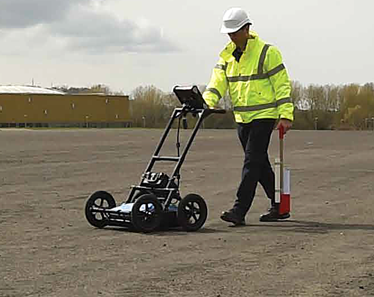 GPR is therefore highly accurate and can be used in sites where no one has an idea of an underground utility running through. The simple operation and cost that comes with GPR is what drives modern markets today. With precise location and detection, minimal damage is caused. This also paves the way for directional drilling to make sure existing lines aren’t damaged in the process or even affect the integrity of a nearby structure. Worker injuries and setbacks are also greatly reduced, which again saves you both time and money. Thanks to technological advancements, ground -penetrating radar is more cost-effective and user-friendly. A few decades ago, such technology and power were only available to skilled operators and dedicated exclusively to experts. Today, such equipment can be operated by anyone with minimal training on how to use it. The user interface is easy to understand, which can be attributed to its design electronically. You don’t need to run through complicated filter settings to operate the equipment. This entry was posted in 808-260-3558 by Dave. Bookmark the permalink.